Peter & John went to pray, They met a lame man on the way. In the name of Jesus Christ of Nazareth rise up and walk! The man asked Peter and John for money, and the first thing they did was look at him. It seems kind of insignificant, but how many of us stop to look at people on the side of the road who beg us for money? But Peter and John both looked right at him, and in doing so, they saw what his need was. Peter and John told the man to look at them. From traveling, I've learned that it is very common for beggars to not make eye contact while asking for money, so it's not surprising that this man was not looking at them, even though he had seen them and asked them for money. But the command of those two disciples caused the beggar to focus his attention and created an expectancy in him: he knew that he was about to get something from them. Peter tells the beggar that he's broke, but he can give him what he has. Now how many of us would have just said, "I ain't got no money" and moved on? I definitely would have. But Peter took this opportunity to share with the man the simple message and the power of the gospel by saying this: "In the name of Jesus Christ of Nazareth, walk". Peter takes the man by the hand and helps him to stand, at which point the man's feet and ankles became strong enough to support his own weight. You could look at this as a combination of faith and works. Peter spoke the words of healing by faith, but also took the step to physically help the man stand. In doing so he made an investment in the man's healing that the man himself could see. He didn't just make the declaration and leave the man there to figure out how to get up on his own. Peter saw what the man needed most, and provided it simply by his faith and his willingness to share it. Instead of focusing on the fact that he didn't have what the beggar was asking for, he shared what he did have, which was what the man truly needed. This is the very essence of what giving should be: a sharing of whatever you have to someone who is in need. Sometimes we get so caught up in the money or resources that we don't have, that we forget that sometimes the best way to meet someone's need is to look at them, to share our faith, to take them by the hand. Sometimes it is too easy for us to think that giving is about how much you give (quantity) instead of what you give (quality). If Peter and John had simply given the man money, he would never have been healed and he wouldn't have known the power of God, which I think is ironic given that the man was carried to the temple every day to beg for money. But how many people are there like that in the world? Who sit at the gate of the temple, begging for our help, but never see the power of God because we don't share it with them? Who never have a reason to praise God because we don't give what we do have, since we're too busy focusing on the silver/gold/etc that we don't have? We should never underestimate the impact of our most sincere gifts. I challenge you to find ways to give to those in need using what you have. Who knows? What you share with someone may change their life! He was walking and leaping and praising God! 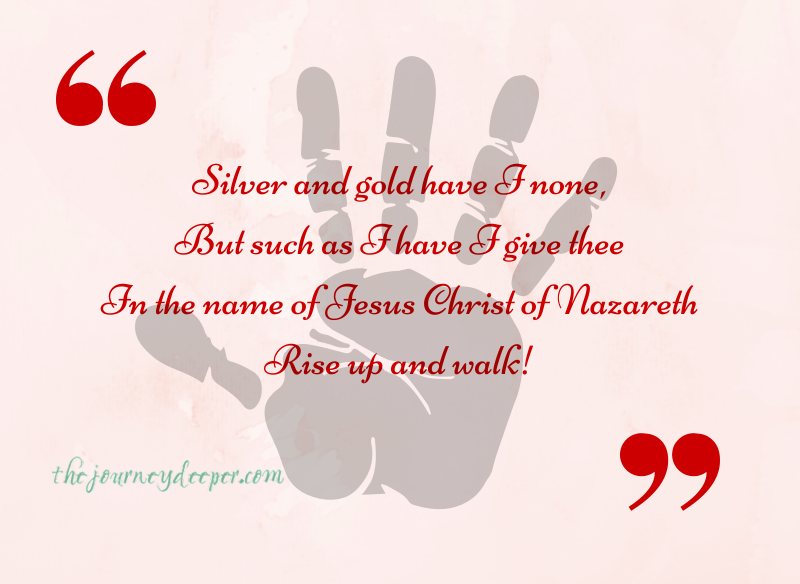 In the name of Jesus Christ, of Nazareth rise up and walk! Be blessed & shine faithfully! 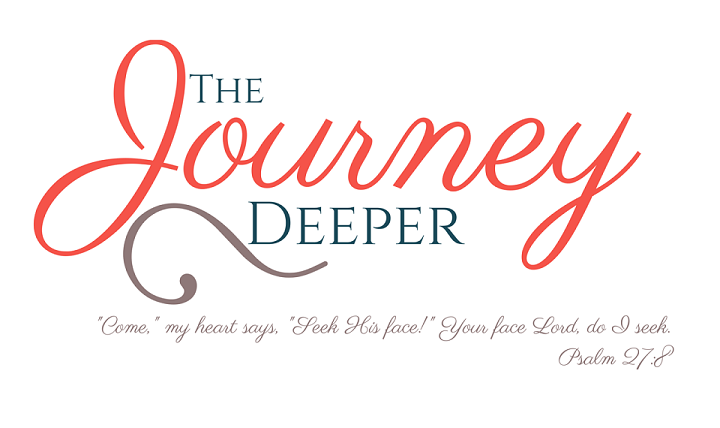 Thank you for sharing what you have, it is so great to be challenged in faith and dependence in what God gives unto us. This is a great word. Stay blessed, a blessing & encouraged! I really enjoyed your comments on the story of Peter and the lame man. The personal applications were very well said. Good job! Thank you so much! The song was one of my favourites as a child, and I happened to have read the story again just before I decided to write this post. I like this song, too...it's going through my head right now! I also like what you said "Sometimes we get so caught up in the money or resources that we don't have, that we forget that sometimes the best way to meet someone's need is to look at them, to share our faith, to take them by the hand." This challenges me. Thanks for the encouragement, sister! It makes me happy to see that other people know that song too! And I'm so glad that you were encouraged by what I had to say!